“It’s horrifying to see tear gas used on mothers and young children as they seek refuge in the United States. 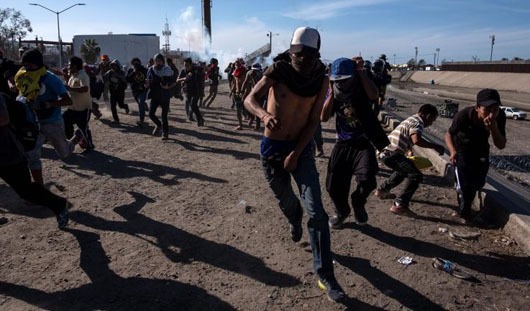 That’s not what America should be,” said Sen. Dianne Feinstein, California Democrat, joining a chorus of criticism from the Left after tear gas was used on a mob of migrants who rushed the U.S. border near San Diego on Nov. 25. Feinstein failed to mention that the use of tear gas at the U.S.-Mexico border was an Obama administration policy that was enforced on a regular basis. According to the Department of Homeland Security (DHS), U.S. Customs and Border Protection used 2-chlorobenzylidene malononitrile, or CS, at least once a month during some years of President Barack Obama’s tenure. CS was deployed 26 times in fiscal 2012 and 27 times in 2013, DHS said. Border authorities also used pepper spray frequently under Obama, including a decade-high record of 151 instances in 2013. In a Nov. 26 interview with CNN, Brandon Judd, president of the National Border Patrol Council, said “This policy that we use was an Obama-written policy and it was used in 2013 at the same port of entry” as the Nov. 25 incident. “The facts are, the policy written under President Obama allows us to use tear gas to disperse a crowd that was very dangerous,” Judd said. After host Erin Burnett scoffed at his facts, saying the agents were using tear gas against women and children, Judd responded by saying “The tear gas was not deployed at the children,” and that migrants had pushed them to the front to use as human shields while throwing rocks and other projectiles at border agents. The Nov. 25 incident near the San Ysidro Port of Entry occurred nearly five years to the day of a similar incident.